In a number of countries inlcuding Finland, District Heating and CHP are regarded as mature technologies and are considered the default solution. In other countries including the UK, major growth is apparent as policy makers and consumers increasingly recognise the financial and environmental benefits. 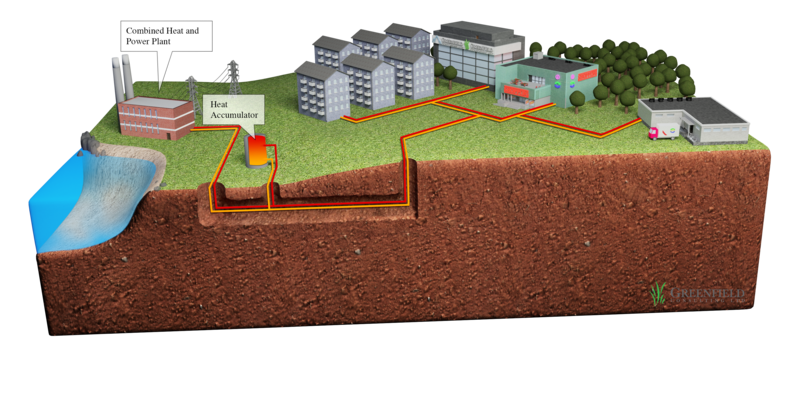 District Heating (DH) is a heating technology in which water heated in an Energy Centre is distributed locally to provide space heating and hot water energy for individual commercial and domestic buildings. The primary distribution system is a closed network insulated pipes through which the water is circulated back to the power plant after delivering heat energy to customers (through heat exchangers). District Cooling (DC) operates in the same way but distributes cooled water (or coolth) through a separate network. Combined Heat and Power (CHP) refers to plant able to generate both electricity and heat simultaneously in a steam cycle or gas turbine, or an internal combustion engine. This technology enables significant primary energy savings of up to 30-40% depending on technology, system design and operating conditions. Operational costs and carbon emissions will also be reduced in a well designed CHP system. Finland is the coldest country in the European Union. Temperatures can drop below -35 degrees C in winter and summer temperatures peak at over +35, and hence heating systems have to function reliably. Built on a heritage of district-wide solutions, Finland is at the forefront in developing sustainable energy solutions. It is one of only two countries for which its District Heating and Cooling systems have been rated with 5 Stars by the International Energy Agency (IEA). district heat sales in 2009 amounted to 31.3 TWh/a and EUR 1760 mill. Despite the strong market position, in Finland, DH & CHP has neither been initiated nor expanded on the basis of regulation but rather as one heating alternative competing on the market. This competitive situation has forced the DH industry to develop and maintain efficient technical and commercial solutions with a focus on customer satisfaction. DH / CHP offer a unique opportunity to mitigate climate change through reduced emissions by saving fuel energy, enabling the use of renewable fuels and secondary energy sources (waste heat, waste heat recovery). CHP is unquestionably the most efficient way to utilize the energy content of various fuels. The efficiency of a CHP plant can be as high as over 90%. In Finland, for instance, the national primary fuel consumption would be more than 30% higher if no CHP were in operation available. Besides direct energy saving. Finland is currently the leading user of biomass in the European Union. DH & CHP can provide this carbon saving but in right applications can be commercially competitive. Future proofing – aim high (city wide) but start with viable core schemes and expand gradually. This enables the best fit and right timing.